Damien Hirst’s “Beautiful Inside My Head Forever” wallpaper is an unexpected interpretation of a floral wallpaper containing a dense pattern of brightly colored flowers with a grid of smashed cigarette butts printed on top. The design plays on the contrasting themes of beauty and trash, or life and death, as Hirst equates littered ashtrays with death. This is a wonderful example of Hirst’s work, combining disparate elements while dispelling the common associations of wallpaper as beautiful and inviting. 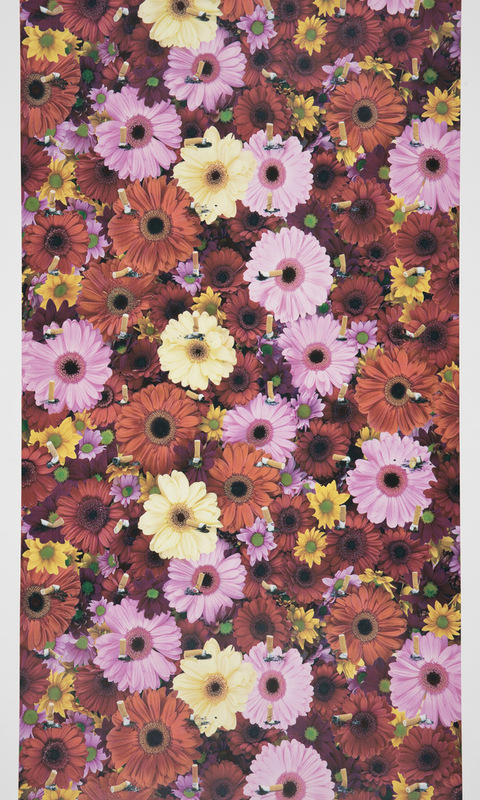 Hirst has designed nine wallpapers with this being his only floral pattern. “Beautiful Inside My Head Forever” uses images from his 2008 work “The Abyss”, where he lined up hundreds, if not thousands, of smashed cigarette butts and ash in mirror-backed medical display cabinets. Cigarettes are a recurring theme in Hirst’s work. In 1996 he created “Crematorium”, a large eight foot diameter ashtray filled with cigarettes, ash, wrappers, and drug paraphernalia. He has also suspended cigarette butts in cubes of resin. In the 1990s he created a glass and steel cell containing a white table and black chair. On the table are a pack of cigarettes, a lighter, and an ashtray filled with cigarette butts. His other wallpaper designs are based on previous artworks and contain intriguing compositions of beetles, butterflies, and pharmaceuticals. “Beautiful Inside My Head Forever” is currently displayed at the museum in The Virtue in Vice exhibition on view from September 27, 2017 – March 25, 2018.